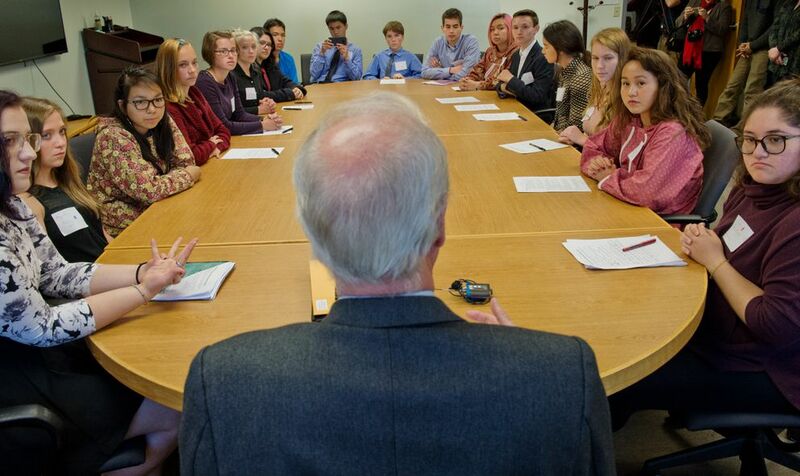 A group of youth activists, impatient with the state's response to global warming, formally petitioned Alaska Gov. Bill Walker's administration Monday to adopt new limits on greenhouse gas emissions, saying that unchecked pollution is threatening their futures. 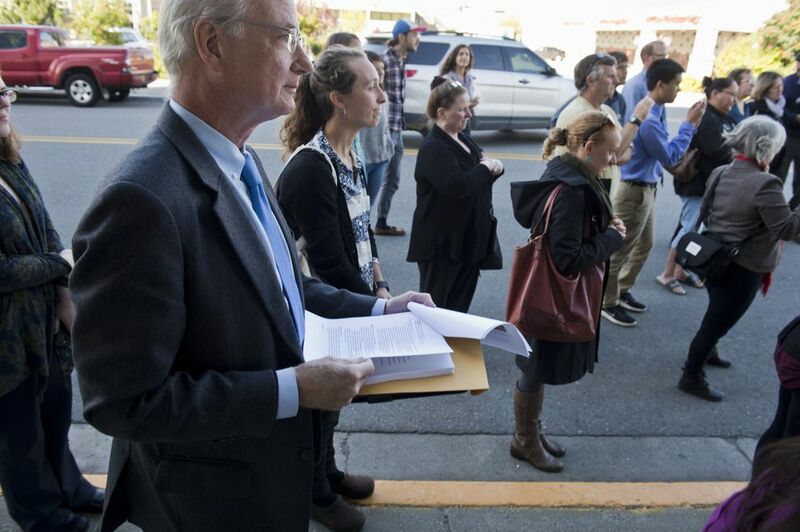 More than a dozen teens, backed by local and national environmental organizations, delivered their petition, with 100 pages of text, directly to Larry Hartig, the state's environmental conservation commissioner, who met the sign-toting group in front of his Anchorage office before giving them an audience in a conference room inside. But Hartig stopped short of promising that Walker's administration would agree to the primary request — that his agency guarantee an 85 percent reduction in carbon dioxide emissions by 2050 from 1990 levels. It's complicated, he told them, when the state's two largest sources of emissions — oil and gas production and aviation — are also critical to its economy. "It becomes more problematic to make big changes without shooting ourselves in the foot economically," Hartig said. But the youth activists said they're getting impatient seeing Alaska's environment changing in front of their eyes, with politicians paying only lip service to the problem of global warming. Climate change, with its melting glaciers, coastal erosion and melting permafrost, they argue, is threatening their health, their traditions and their ability to hunt and fish. "We talked to our legislators, the lieutenant governor Byron Mallott and our governor, Bill Walker. And the response we got was, 'We agree with you.' But the actions were none," said Sofia Astaburuaga, 17, one of several teens to deliver a speech from a podium set up on the sidewalk outside Hartig's office. "We want to see something get done." The youth activists came from across the state, from Utqiagvik (Barrow) to Unalakleet to Sterling on the Kenai Peninsula. Wearing blazers, neckties and kuspuks, they assembled outside the glass-walled DEC office on Cordova Street in Anchorage with handmade signs: "There is no Planet B," "Denial is not a policy" and "Science, not silence." Two environmental organizations are supporting their agenda. One is the Alaska Center — the Anchorage-based group that grew out of the Alaska Center for the Environment — and the other is Our Children's Trust, a national group based in Eugene, Oregon, that assists youth climate activists. The groups' involvement isn't a secret, given the complicated legal work — and more than 900 footnotes — that went into the youth activists' 100-page petition, which was drafted by Eagle River attorney Brad De Noble. But it's the young people setting the direction, said 15-year-old Jennifer McCumber of Utqiagvik. "We're the ones who decide what's happening and how it's going to be done," said McCumber, a granddaughter of Inupiat leader Eben Hopson. The new petition asks DEC to take three major steps: publishing annual inventories of greenhouse gas emissions; ensuring carbon dioxide reductions of 85 percent; and developing a "climate action plan" to meet that target. The activists filed their request under a formal but rarely used section of the Alaska Administrative Procedure Act that allows "interested persons" to petition state agencies to adopt regulations; it requires DEC to either reject the request or schedule a public hearing within 30 days. The petition argues that DEC has authority to regulate greenhouse gas emissions based on a separate law requiring state policy to conserve and protect natural resources — and to manage them "as trustee of the environment for the present and future generations." The department will start by reviewing the petition with state attorneys from the Department of Law, said Gary Mendivil, a regulations specialist at DEC. As long as the proposal fits within DEC's legal authority, it will likely advance to a public hearing and then be analyzed by department experts, he added. In 2015, former President Barack Obama used the state's melting glaciers as a backdrop in his push for a global pact in the leadup to the Paris climate talks. He visited Exit Glacier in Seward and urged foreign diplomats at an Anchorage conference to take in the state's "God-given majesty." "Remind yourself that there will come a time that your grandkids and mine — if I'm lucky enough to have some — they'll want to see this," he said. But since his election in November, President Donald Trump — who's defied scientific consensus by declaring climate change a hoax — has reversed Obama-era climate policies and efforts, withdrawing the United States from the Paris agreement earlier this year. Last month, a senior Department of the Interior official, Joel Clement, wrote an opinion piece in The Washington Post asserting that he was reassigned for "speaking out publicly about the dangers that climate change poses to Alaska Native communities." Alaska environmental activists see a potential ally in Walker's administration, which was elected in 2014 with the support of the Democratic Party and quickly started examining whether to resurrect a dormant climate change panel created by former Gov. Sarah Palin, herself an ally of legislative Democrats for the first two years of her administration. But the climate change cabinet was never reborn. Advocates now say they're growing frustrated by what they describe as a slow pace of change. Administration officials say they've been distracted by their work to fix the state's massive deficit, but still plan to unveil a promised climate change policy before the end of the year. At least two of the teen advocates will be invited to a stakeholder meeting next month to discuss the draft policy, said Claire Richardson, chief of staff to Mallott, whose office leads the administration's climate change efforts. And Hartig told his visitors that his agency is set to release an updated inventory of the state's emissions in the next few weeks. Asked about Monday's criticism from the youth activists, Richardson, in a phone interview, said: "I feel their pain." "There's lots of things we wanted to move on quickly, but as soon as we took office, oil started plunging and we've been busy trying to deal with the fiscal crisis," she said. "I'm sure it's really frustrating for them. But also they have to understand that there have been a lot of other front-burner priorities — and this is still really important." Any new climate policies or regulations are likely to face opposition from conservative groups and Republicans in the state Legislature, who argue that limits on greenhouse gas emissions would hurt the state's economy — and especially its oil and gas producers. Jeremy Price, director of the Alaska branch of the conservative group Americans for Prosperity, said he's more concerned with the ability of his three children to get a job in the state than he is with the threat posed by climate change. Emissions reductions like those proposed in the activists' petition, he argued, would make it more expensive to live in the state, and hit poor and rural Alaskans the hardest. "I care about the environment, obviously — I love Alaska," he said. "But the future of this state, in my mind, is contingent on having a healthy economy."